Previously we mentioned about System Explorer v1.5 that could replace your default task manager program in Windows PC but if you think that is still not good enough, here you can have another option of a much more powerful task manager application, named as Extended Task Manager that can help to monitor all the running processes in terms of conventional CPU, memory, networking connectivity with external devices and additional disk I/O (Input Output) and port usage details. The free software utility can be minimized in system tray and run on background and when there is a need to bring it up, just click on the icon and it will show you all the dynamically change CPU and memory usage in colorful graphical chart. As usual, users can choose to terminate specific tasks that were not responsive to bring the system back to normal condition. 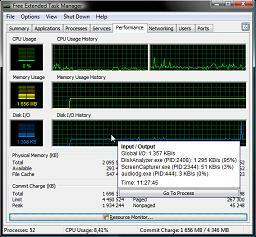 As compared to default task manager, there are two additional data such as disk I/O (Input Output) and port details that shows which processes utilize most of your system disk and specific processes that were connected to which local and remote port, with detailed IP address information respectively. These will allow a better visibility in terms of whole system utilization that even include any external networks connectivity such as Wireless 3G Network, Bluetooth and Local Area Network that were connected to the host PC via any specific port. Another benefit is users can just put their mouse cursor on any of the graph and it will show respective details such as the processes that contribute to highest CPU, memory, networking utilization and even more at any specific time. Users can get a free download at here.